There's a good reason the Broadway Palm Dinner Theater in Ft Myers, Florida has been entertaining almost 200,000 guests a year for nearly 20 years - this may be the best Broadway-style dinner show in the sunshine state! With a main theater that seats 448, you can choose dinner table seats (which include dinner) or theater seats (for just the show.) There doesn't seem to be a bad seat in the house. We visited the Broadway Palm Dinner Theater for their production of SEUSSICAL: THE MUSICAL. It was fantastic! The play was well-written and enjoyable for all ages. The cast was exceptionally talented at music, dance and comedy and the stage, costumes and props were perfectly "Seussical" in that familiar yet twisted way we have loved since childhood. The Broadway Palm Dinner Theater is part of the Prather Entertainment Group, the largest operator of Dinner Theaters in the United States, which produces over 30 productions annually at its three entertainment facilities: the Dutch Apple Dinner Theatre in Lancaster, Pennsylvania and the Broadway Palm Dinner Theatres in Fort Myers, Florida and Mesa, Arizona. They also produce and present full-scale tours of musicals in venues throughout the country such as Beehive: The 60ï¿½s Musical in 2007 and The Wedding Singer. Owners Thomas Ross Prather, Deborah Z. Prather and William T. Prather have entertained over 3 million audience members with Broadway-caliber musicals year-round for more than 30 years. 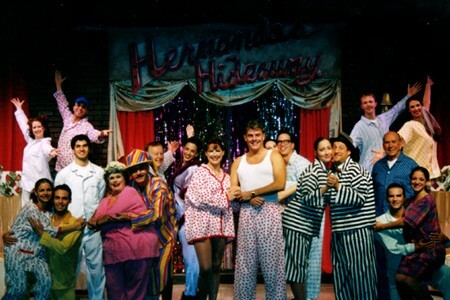 The Broadway Palm Dinner Theater offers both dinner shows and matinees throughout the year for many of their productions.